You are welcome to snail mail your Yardstick into: Beta Sigma Phi International/Service Department (Yardstick), Box 8500, Kansas City, MO 64114-0500. This Form fills in best on a PC (laptop or desktop). You can use your smart phone or tablet, it is up to you to use the devices to submit the form of which could make it harder for you to see and find the fields to fill in. Always have a back up yardstick copy in case something does not work with what you are using to make the electronic submission. This is a measuring tool of how your chapter met goals during the year. Special arrangements will be made for chapters organized less than a year. 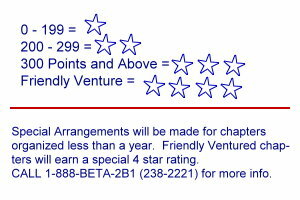 Chapters who Friendly-Ventured during 2018-2019 year will earn a special four-star rating. Contact the membership department toll free for further information 1-888-BETA-2B1 (1-800-238-2221). Please be aware that changes/additions have been made to the Yardstick points in the area of the Bonus Section Volunteering and Online Hosting. NOTE: The Electronic Yardstick will remain on line and allow you to submit your yardstick at anytime to International (even after August, 2019). If received after May 1, 2020, results will not be posted. This form is provided for the purpose of easily sending your chapter yardstick form by E-mail to Beta Sigma Phi International. You may submit your yardsticks on line to International's Service Department. It is recommended that you have your information readily at hand before completing and sending the form. Please be sure to check all information for accuracy before clicking on the "SEND" button. Use "O's" for fields you are leaving blank. Try to NOT use the scrolling device on your mouse - instead use the scroll bar to the right on your browser. When going back to check or resubmit because the form was not complete, please note that you could lose some of the information in the fields and will have to start again. The form does not transfer the information over until you push that SUBMIT button. Try using your TAB key to go from field to field to fill out the blanks. Deadline to send in your Yardstick to be included in the Torch in the fall, 2019 is August 20, 2019. Remember: You may continue to send in your yardsticks year round. Again, if received after May 1, 2020, results will not be posted. Note: Because of the various sizes and locations of chapters, the star ratings may not sufficiently categorize the activities of the chapter. Again, this is only a measuring tool and not, a rating of the chapters themselves. 10 points for percentage of attendance (7 for 70%, etc.) Members on leave of absence are not counted against percentage. 2 points for a consistent system of notifying members of time and place of meetings. If you would like to know if your Division Chairman received the Electronic Yardstick, then E-mail her please. Please Put "Yardstick Inquiry" in the subject line. Don't forget your first and last name in the body of the E-mail. To ensure that you and we receive all communications by E-mail, please add betasigmaphi.org and betajournal.com to your E-mail address book or approved/safe sender list. Please remember to put a subject heading in the subject line of your E-mails to us along with your chapter name and number.